Stems: Erect, clustered, 4-sided, usually branched above, upper portion pubescent. Leaves: Opposite, simple, stalked, lanceolate to ovate, 1 to 4 inches long, 1 to 1.5 inch wide, glabrous or sparsely hairy above, hairy below; margins coarsely-toothed to nearly entire; tips pointed. Inflorescences: Solitary heads, to 3 inches wide, terminal; bracts green to whitish, tips bent downward. Flowers: Calyces 5-lobed, hairy; corollas 2-lipped, to 1.5 inch long, lavender, outer surface minutely hairy; upper lip extending forward, tip hairy; lower lip 3-lobed, spreading; stamens 2, extending beyond corolla tips. Fruits: 4 nutlets, smooth, brown to black, each 1-seeded. Habitat: Rocky prairies, pastures, thickets, stream banks, and roadsides. Uses: Great Plains Native Americans used this plant for numerous medicinal purposes, including treatment of colds, fevers, coughs, stomach pains, respiratory difficulties, and acne. They also used it to perfume their hair and clothes. The dried leaves yield a pleasing tea when boiled in water. 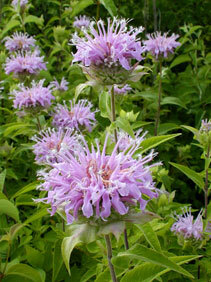 Comments: These long-blooming, fragrant flowers are especially inviting to bees, thus the name "beebalm". Wild bergamot tolerates drought conditions well.